van Lent PL, van den Hoek AE, van den Bersselaar LA, Spanjaards MF, van Rooijen N, Dijkstra CD, van de Putte LB, van den Ber WB. In vivo role of phagocytic synovial lining cells in onset of experimental arthritis. Am J Pathol. 1993 Oct;143(4):1226–37. The in vivo role of phagocytic synovial lining cells (SLC) was studied in acute experimental arthritis in the mouse. SLCs were selectively depleted by injecting liposomes encapsulating the drug dichloromethylene diphosphonate (CL 2 MDP, clodronate). 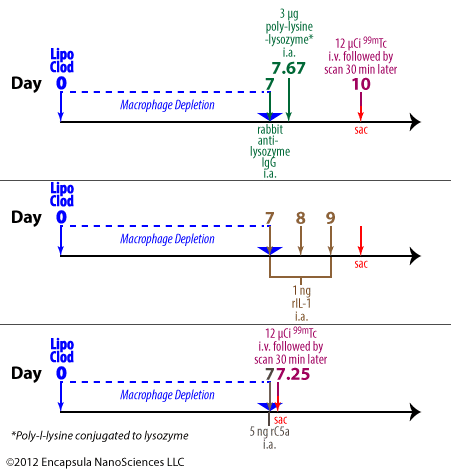 Optimal depletion of phagocytic lining cells occurred 7 days after CL 2 MDP liposome injection. Eliciting an immune complex-mediated arthritis in SLC-depleted knee joints largely prevented inflammation if compared to control arthritic knee joints. Joint swelling and influx of inflammatory cells into the joint cavity was markedly diminished. Cartilage damage, in this model related to influx of inflammatory cells, was significantly decreased. Reduced influx of inflammatory cells (mainly polymorphonuclear neutrophils) was correlated to a decreased production of chemotactic factors as measured in washouts of arthritic joints in a two-compartment Transwell system. Interleukin-1-driven chemotactic factors seem to be involved. Interleukin-1 levels were significantly lowered in SLC-depleted arthritic knee joints as compared to controls. Injection of recombinant murine interleukin-1 in SLC-depleted knee joints caused less influx of inflammatory cells as compared to injection into control knee joints. A specific damage of CL 2 MDP liposome treatment to synovial blood vessels was excluded as intraarticular injection of human recombinant C5a in lining-depleted knee joints showed similar influx of inflammatory cells if compared to human recombinant C5a injection in control knee joints. This study indicates that in immune complex-mediated arthritis, phagocytic lining cells regulate the onset of the inflammatory response. Experimental timeline for van Lent, et. al. . Liposomal clodronate or controls were injected intra-articularly on day 0 followed by induction of immune complex-mediated arithritis by various methods on day 7.
van Rooijen N. The liposome-mediated macrophage “suicide” technique. J. Immunol. Methods. 1989 Nov 13;124(1):1–6. In another experiment, 1 ng rIL-1 was dosed intra-articularly for 3 days after liposome treatments. Animals were sacrificed and tissue examined for PMN infiltration. In a 3rd experiment, 5 µg human rC5a was injected into the knee joints and knees evaluated for uptake of 99mTc; histilogical analysis also performed. The authors report a 67% reduction in joint swelling as measured by 99mTc uptake in synovial macrophage-depleted animals. Proteoglycan synthesis and degradation, a measure of cartilage deteriorization, was reduced by about 50% when synovial macrophages were depleted prior to arthritis induction. Cytokine washouts of arthritic joints from animals depleted of synovial macrophages was only about 50% as effective as control animal washouts in eliciting PMN migration in transwell assays. At 6 h post-induction of arthritis, the level of IL-1 measured in the synovial fluid of macrophage depleted animals was about half the level of IL-1 detected in control animal synovial fluid. Significantly fewer PMN migrated into the synovia of macrophage depleted mice post-treatment with intra-articular IL-1 compared to control animals (no cell counts reported). To ensure that clodronate liposome treatment did not adversely effect the capillaries of the synovial tissue such that inflammatory mediator effects were inhibited, human rC5a, which does not require cytokine mediators in soliciting an inflammatory response, was shown to elicit an inflammatory response irrespective of clodronate liposome treatment. 125I-labeled poly-lysine-lysozyme clearance was monitored post-intra-articular injection to confirm that the antigen complex did not leave the joint more quickly in clodronate liposome-treated animals; it did not. The level of antigen complex has been shown to correlate to arthritis severity. The authors point out that IL-1, itself, is not chemotactic, thus the mechanism of PMN infiltration is due to an indirect effect of IL-1 on inflammatory cells in initiating the release of chemotactic factors.